This photograph was taken on Loughborough Road, looking towards the Loughborough direction. The houses on the far left are Orton Villas, built in 1904 (numbers 18 & 20), starting with number 18 on the left. The Orton Villas plaque can be clearly seen today. 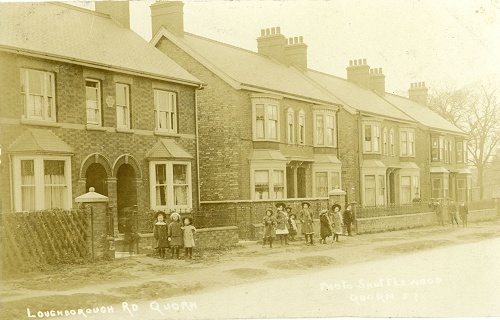 The photographer was William Shuttlewood who lived in Quorn with his wife and three children for a relatively short period -from about 1905 to about 1909. However he obviously enjoyed photography and Quorn owes him a great debt for the wonderful pictures he took at this time. Many examples of his work can be found in the collection and his full story is told elsewhere on the site. This card was posted on 11h April 1906, and is addressed to Miss Northmore, Mayfield, Paignton, Devon. The writer of the card is Susannah Shuttlewood, William's wife, and she is writing to one of her sisters. Estella was William and Susannah's youngest daughter and was about 6 years old when this photograph was taken. She is the second child from the left. The quality of the photograph is excellent and when scanned at high resolution and increased in size we can see that Estella is smiling. It was not unusual at that time for small private schools to be set up in ordinary houses.